Auk is the common name for any member of the bird family Alcidae in the order Charadriiformes. 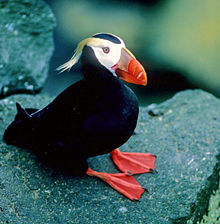 They are diving seabirds with a chunky body, short wings and legs, and webbed feet and are found in northern climates (Arctic, subarctic, temperate regions). The about two dozen recognized species of extant (living) auks are placed in the subfamily Alcinae and include true auks and murres (tribe Alcini), murrelets and guillemots (tribes Brachyamphini, Synthliboramphini, and Cepphini), puffins (tribe Fraterculini), and auklets (tribe Aethiini). Auk's wing-propelled diving ability allows them to be efficient for capturing certain prey, depending on their particular adaptations. Some, such as the murres (Uria), are more efficient under water and can capture faster schooling fish; others, such as the auklets, which are better adapted for flying and walking, tend to take slower moving krill. In addition to playing key roles in marine food chains, auks, with their unique adaptations, including breeding behavior, add to the human fascination with nature. Despite these values, auks have sometimes suffered greatly from anthropogenic factors. The great auk was hunted on such as significant scale for food, eggs, and down that it became extinct by the mid-nineteenth century. The auks are restricted to cooler northern waters, with most species in the Pacific. Their ability to spread further south likely is restricted as their prey hunting method, pursuit diving, becomes less efficient in warmer waters. The speed at which small fish (which along with krill are the auk's principal food items) can swim doubles as the temperature increases from 5°C to 15°C, with no corresponding increase in speed for the bird. The southernmost auks, in California and Mexico, can survive there because of cold upwellings. The current paucity of auks in the Atlantic (six species), compared to the Pacific (19-20 species) is considered to be because of extinctions to the Atlantic auks; the fossil record shows there were many more species in the Atlantic during the Pliocene. Auks also tend to be restricted to continental shelf waters and breed on few oceanic islands. Many species of auks, principally the true auks, are superficially similar to penguins due to their black-and-white colors, their upright posture, and some of their habits. Nevertheless they are not related to the penguins at all, but considered by some to be a product of moderate convergent evolution. 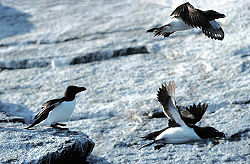 In contrast to penguins, modern auks are able to fly (with the exception of the recently extinct Great Auk). They are good swimmers and divers, but their walking appears clumsy. Due to their short wings auks have to flap their wings very quickly in order to fly. 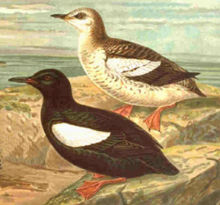 Extant auks range in size from the least auklet (Aethia pusilla), at 85 grams (3 ounces) and 15 centimeters (six inches), to the thick-billed murre (Uria lomvia), at one kilogram (2.2 pounds) and 45 cm (18 inches) and the razonbill (Alca torda) at up to 43 cm in length with a 60-69 cm wingspan. The flightless Great Auk (Pinguinus impennis) was the largest, standing about 75 centimeters (30-34 inches) high and weighing around five kilograms (Livezey 1988), but it became extinct around the mid-nineteenth century. Several species have different names in Europe and North America. The guillemots of Europe are murres in North America, if they occur in both continents, and the little auk becomes the Dovekie. Auks live on the open sea and only go ashore for breeding, although some species, like the common guillemot, spend a great part of the year defending their nesting spot from others. 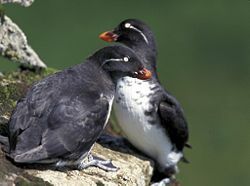 Some species, such as the Uria guillemots, nest in large colonies on cliff edges; others, like the Cepphus guillemots, breed in small groups on rocky coasts; and the puffins, auklets and some murrelets nest in burrows. All species except the Brachyramphus murrelets are colonial. Colonial species tend to use the same breeding grounds each year, and individually even the same nesting site. The feeding behavior of auks is often compared to that of penguins; they are both wing-propelled pursuit divers. In the region where auks live, their only seabird competition is with cormorants (which dive powered by their strong feet); in areas where the two groups feed on the same prey the auks tend to feed further offshore. Although not to the extent of penguins, auks have to a large extent sacrificed flight, and also mobility on land, in exchange for swimming; their wings are a compromise between the best possible design for diving and the bare minimum needed for flying. This varies by subfamily. The Uria guillemots (including the razorbill) and murrelets are the most efficient under the water, whereas the puffins and auklets are better adapted for flying and walking. This reflects the type of prey taken; murres hunt faster schooling fish, whereas auklets take slower moving krill. Time depth recorders on auks have shown that they can dive as deep as 100 meters in the case of Uria guillemots, 40 meters for the Cepphus guillemots, and 30 meters for the auklets. Traditionally, the auks were believed to be one of the earliest distinct charadriiform lineages due to their characteristic morphology. However, molecular analyses have cast doubt on this view. For example, as opposed to plovers (a much older charadriiform lineage), auks radically changed from a wading shorebird to a diving seabird lifestyle. Thus, today, the auks are no longer separated in their own suborder (Alcae), but are considered part of the Lari suborder that otherwise contains gulls and similar birds. Judging from molecular data, their closest living relatives appear to be the skuas, with these two lineages separating about 30 million years ago (Paton et al. 2003). This may or may not be correct due to uncertainties of the fossil record (Thomas et al. 2004, and see below). Alternatively, auks may have split off far earlier from the rest of the Lari and undergone strong morphological, but slow molecular evolution, which would require a very high evolutionary pressure, coupled with a long lifespan and slow reproduction. The earliest unequivocal fossils of auks are from the Miocene (e.g. the genus Miocepphus, 15 million years ago). Two very fragmentary fossils often are assigned to the Alcidae, although this may not be correct: Hydrotherikornis (Late Eocene, some 35 million years ago) and Petralca (Late Oligocene). Most extant genera are known to exist since the Late Miocene or Early Pliocene (about 5 million years ago). Miocene fossils have been found in both California and Maryland, but the greater diversity of fossils and tribes in the Pacific leads most scientists to conclude that it was there they first evolved, and it is in the Miocene Pacific that the first fossils of extant genera are found. Early movement between the Pacific and the Atlantic probably happened to the south (since there was no northern opening to the Atlantic), later movements across the Arctic Sea (Konyukhov 2002). The flightless subfamily Mancallinae which was apparently restricted to the Pacific coast of southern North America, became extinct in the Early Pleistocene. The extant auks (subfamily Alcinae) are broken up into two main groups: the usually high-billed puffins (tribe Fraterculini) and auklets (tribe Aethiini), as opposed to the more slender-billed murres and true auks (tribe Alcini), and the murrelets and guillemots (tribes Brachyramphini and Cepphini). The tribal arrangement was originally based on analyses of morphology and ecology (Strauch 1985). mtDNA cytochrome b sequence, and allozyme studies (Friesen et al., 1996; Moum et al., 2002) confirm these findings except that the Synthliboramphus murrelets should be split into a distinct tribe, as they appear more closely related to the Alcini—in any case, assumption of a closer relationship between the former and the true guillemots was only weakly supported by Strauch's 1985 study. Compared to other families of seabirds, there are no genera with many species (such as the 47 Larus gulls). This is probably a product of the rather small geographic range of the family (the most limited of any seabird family), and the periods of glacial advance and retreat that have kept the populations on the move in a narrow band of subarctic ocean. Biodiversity of auks seems to have been markedly higher during the Pliocene (Konyukhov 2002). Collinson, M. 2006. Splitting headaches? Recent taxonomic changes affecting the British and Western Palaearctic lists. Brit. Birds 99(6): 306-323. Retrieved September 2, 2007. Friesen, V. L., A. J. Baker, and J. F. Piatt. 1996. Phylogenetic relationships within the Alcidae (Charadriiformes: Aves) inferred from total molecular evidence. Molecular Biology and Evolution 13(2): 359-367. Retrieved September 2, 2007. Konyukhov, N. B. 2002. Possible ways of spreading and evolution of alcids. Izvestiya Akademii Nauk, Seriya Biologicheskaya 5: 552–560 [Russian version]; Biology Bulletin 29(5): 447–454 [English version]. Livezey, B. C. 1988. Morphometrics of flightlessness in the Alcidae. Auk 105(4): 681–698. Retrieved September 2, 2007. Moum, T., U. Arnason, and E. Árnason. 2002. Mitochondrial DNA sequence evolution and phylogeny of the Atlantic alcidae, including the extinct great auk (Pinguinus impennis). Molecular Biology and Evolution 19(9): 1434–1439. Retrieved September 2, 2007. Paton, T. A., A. J. Baker, J. G. Groth, and G. F. Barrowclough. 2003. RAG-1 sequences resolve phylogenetic relationships within charadriiform birds. Molecular Phylogenetics and Evolution 29: 268-278. Strauch, J. G. 1985. The phylogeny of the Alcidae. Auk 102(3): 520-539. Retrieved September 2, 2007. Thomas, G. H., M. A. Wills, and T. Székely. 2004. A supertree approach to shorebird phylogeny. BMC Evol. Biol. 4: 28. Retrieved September 2, 2007. This page was last modified on 2 April 2008, at 02:43.